Flexible, cost effective office accommodation on a popular business in Perth. Fully serviced, with great road and rail links within a short distance. This centre offers a range of office sizes, all with additional storage space. The rent is inclusive of WiFi, heating and electricity bills. There are communal kitchen facilities and an intercom entry system. The space is filled with natural light, ensuring a bright and airy working environment. The property boasts great transport links with Perth railway station less than 15-minutes away on foot. Stylish, recently opened business centre offers a range of flexible office spaces close to the centre of Perth. Equipped with phone and broadband lines. Easy access to transport routes, with a range of nearby amenities. This serviced office centre boasts an excellent location and offers light and spacious contemporary office accommodation. Free parking is available, and offices enjoy panoramic views. With an ideal location just a short drive from the centre of Perth, and close to a variety of local amenities, this centre provides spacious office suites in a number of arrangements. This centre enjoys an ideal location just a few minutes' drive from the centre of Perth. The centre provides bright and spacious part-serviced offices with breathtaking views. A range of business support services is also available to clients. A five-minute drive from the city centre and a mile away from the railway station, this centre is ideally situated for travel to the rest of Scotland and beyond. Built in 2003 there are a variety of furnished and serviced offices that range from 173 sq. ft. upwards. Extensively refurbished and located immediately adjacent to St Catherine's Retail Park this ideal Perth office space has an abundance of natural light. Current tenants of this office space include Perth & Kinross Council, Skills Development Scotland, Curves, and The Bed Centre. These open-plan suites benefit from high levels of natural daylight, and open plan configurations. 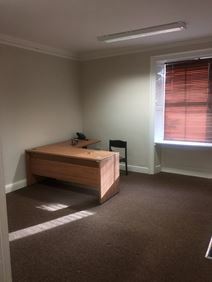 This center is the ideal office location within Perth, situated minutes away from the mainline railway station, the bus station and the excellent shopping facilities of the town centre. Located in the centre of Perth, just 5 minutes from Perth train station, these fully serviced offices are available on flexible terms. Offering reception services and ample parking. Offering comfortable office suites suitable for small businesses, this refurbished centre is available now on flexible terms. The centre enjoys a prominent position, just a few minutes away from the railway station.